How Much is Inside a Can of Expanding Foam? How much expanding foam is there in a can? It is hard to tell. On Feb 13, 1999, Mike and I found out. The foam is created as the two liquids in the can combine. The chemical reaction between the liquids releases gas into the emerging, hardening mass. 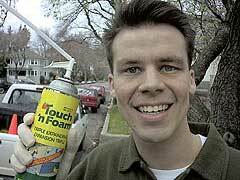 Expanding foam is a remarkable product, more of a toy, in my opinion, than any other chemical in Home Depot. I have had some experience with an older product, the 2-part expanding foam kit, sold in small cans like rubber cement. The two-part foam is less convenient, but much cheaper per cubic inch of foam. The foam we used was Touch 'n Foam, in the 20 oz. can. 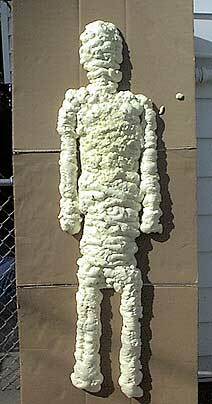 I made a rough outline of a body on a sheet of cardboard and began filling in the body with expanding foam. 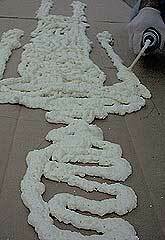 The foam emerges in a long snake, about as wide as a garden house. 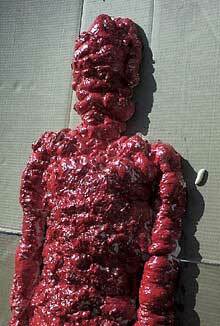 It quickly expands to the size of fire hose, and continues to slowly expand and harden for the next 30 minutes. The cans are not inexpensive, and if you use the can even a little bit, the hardened foam will block any further use of the can, so don't use any until you are ready to use it all. Also, the uncured foam sticks with amazing tenacity to any surface, so always wear gloves. Furthermore, never glob it onto your head or face to give yourself horns or a funny nose. When Mark gets back from the hospital, we are going to do public service messages about that. My little figure filled out nicely. I made the torso too long, but it was definitely human-shaped. I was hopeful that the foam would expand enough to give my figure a realistic depth, but the foam was not up to the task. In 30 minutes I had Flat-man. He measured 5'6", and had about a 22" waist. He weighed less than the white pages. Perhaps filling an aquarium would have been a better display of the actual volume of foam produced, but I was afraid the foam would actually BREAK the glass in its relentless expansion. Flat man hung around my apartment for a few days before he started BOTHERING me. I grew tired of his blank stare and jealous of his perfect posture. Even painting him a festive red didn't help! Before the end of the week, I was burying him in a shallow grave at the elementary school. Flat man will definitely never bother anyone again. Update: Flatman actually took TWO 20 oz. cans of expanding foam. Plan accordingly.